SKU: 4191. 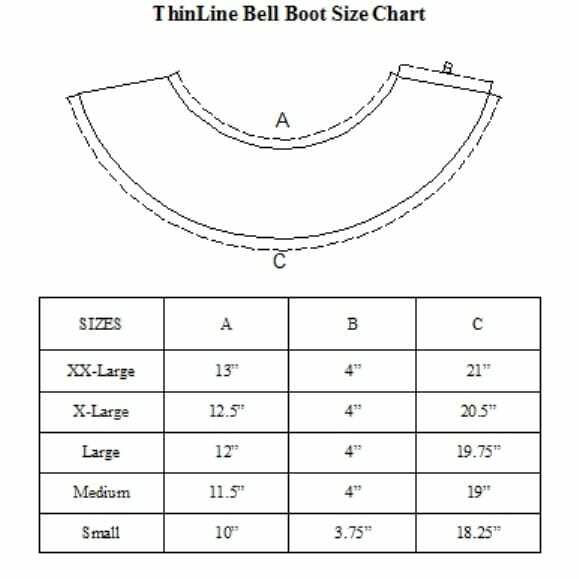 Categories: Shop All ThinLine Products, Hunter Jumper Tack, Dressage Equipment, Horse And Rider Tack, Equine Bell Boots, Horse Boots, Pony Size Tack. Tag: bell boot. Made with a strong, synthetic, outer shell and lined with ThinLine material. 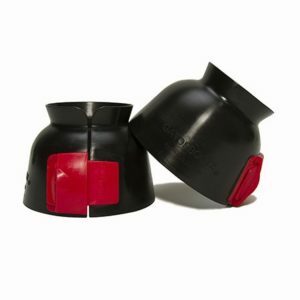 Offers impact protection superior to other bell boots. Designed to protect the horse during work or turnout. Built slightly shorter than most turnout boots, these will not interfere with work. ThinLine will not absorb water and does not generate heat. Anti-fungal to protect against fungus and rain rot. Lined with genuine sheepskin on the hide for comfort and a great look in the show arena. 30-day satisfaction guarantee. One year warranty. Hassle Free Returns. Care Instructions: Bell boots can be hosed or sponged off with water or wiped down with ThinLine Cleaners. They also may be machine washed in cold water in any machine with no agitator. Use a mild detergent. Hang boots to dry. We recommend a little scotch guard on the sheepskin to keep stains at bay.